Jimmy Blake is a self-described “average guy.” A Vietnam veteran, he spent 30 years driving trolleys and buses for the MBTA. Retired in 2008, Jimmy was enjoying movies with friends, playing golf and bocce, and traveling with his wife Lisa and daughter Ashley. Everything changed in September 2013 when Lisa discovered Jimmy on the bathroom floor at their Quincy home. Jimmy was unable to move or communicate, and Lisa had no idea what had happened to him. Assessing the seriousness of Jimmy’s condition, EMTs told Lisa that they should drive him a few extra miles to Boston Medical Center’s Trauma Center. Jimmy’s sudden collapse and weakness in his arms and legs initially led doctors to look for signs of stroke. While trying to confirm his diagnosis, a CT scan revealed something no one had expected: a fracture between the cervical vertebrae in his neck. “Jimmy has vasovagal syncope, a condition that can cause loss of consciousness. It had never given him problems in the past, but in this particular instance, we believe he fainted and his fall on the bathroom floor caused the fracture,” explained Chadi Tannoury, MD, a spine surgeon in BMC’s Department of Orthopedic Surgery. Jimmy’s damaged vertebrae were pressing on his spinal cord and causing his paralysis. In cases like these every moment matters. Led by Dr. Chadi Tannoury, BMC’s Orthopedic Surgery team whipped into action. Instead of risking moving Jimmy to the main operating suite in another building, the team quickly set up an OR near the ICU where Jimmy was being monitored. During a lengthy overnight surgery, Dr. Tannoury removed Jimmy’s broken vertebrae and replaced them with a carefully sculpted cadaver bone supported by plate and screws. The surgery relieved pressure off of Jimmy’s spinal cord and stabilized his neck. Although a nerve conduction study showed hopeful signs that Jimmy’s nerve pathways may still be active in his legs, he was deemed quadriplegic and his journey to recovery was extremely uncertain. “Everyone with a spinal cord injury has a different outcome. Some have only subtle improvements while others make drastic progress. The extent of recovery can only be determined over time,” explained Dr. Tannoury. After 25 days at BMC, Jimmy was transferred to the West Roxbury VA Hospital to continue his rehabilitation. While Lisa and Ashley were upbeat about his slow progress, Jimmy remembers being in a darker place. “I wasn’t very hopeful. I didn’t have a good outlook. Then one day my daughter came into my hospital room, held my hand and said ‘Dad you are going to walk me down the aisle at my wedding.’ That was all I needed to hear to get motivated,” recounts Jimmy. From then on, Jimmy’s attitude shifted and with it came gains in his recovery. Subtle hand movements gave way to more upper body mobility. His lower body strengthened until eventually he was able to stand and then walk with the help of a walker. Nine months after his injury, Jimmy was able to return home. He will always be considered quadriplegic because of his spinal cord injury, but he has regained neurological function in his arms and legs. “It is a miracle to see where we are today. It wouldn’t have been possible without Jimmy’s wonderful caregivers, our amazing support system of family and friends and the power of prayer,” said Lisa. 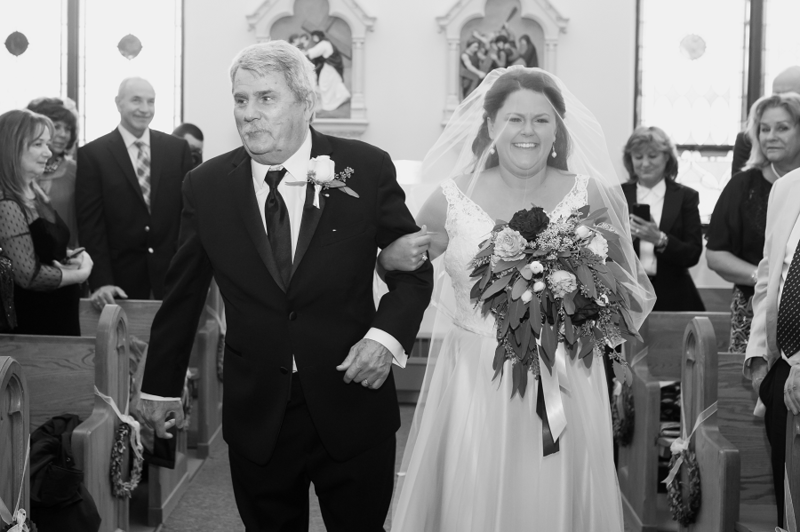 On November 5, 2016, Jimmy walked his daughter down the aisle without the aid of a walker or a cane. A pinnacle in any father’s life, there wasn’t a dry eye in the church as family and friends watched Jimmy with his daughter at that moment. Today Jimmy continues to prove that he is anything but average. He is able to drive and has regained the freedom to get back to all the things he loves. Now Jimmy and Lisa visit other people with spinal cord injuries to share their miraculous journey and provide hope.